Canada is 151 years old! That might be young for a country, but this afternoon we, along with many others, visited Fort Rodd Hill, a National Historic Site. Constructed in the 19th century, it has never fired a weapon against an enemy. 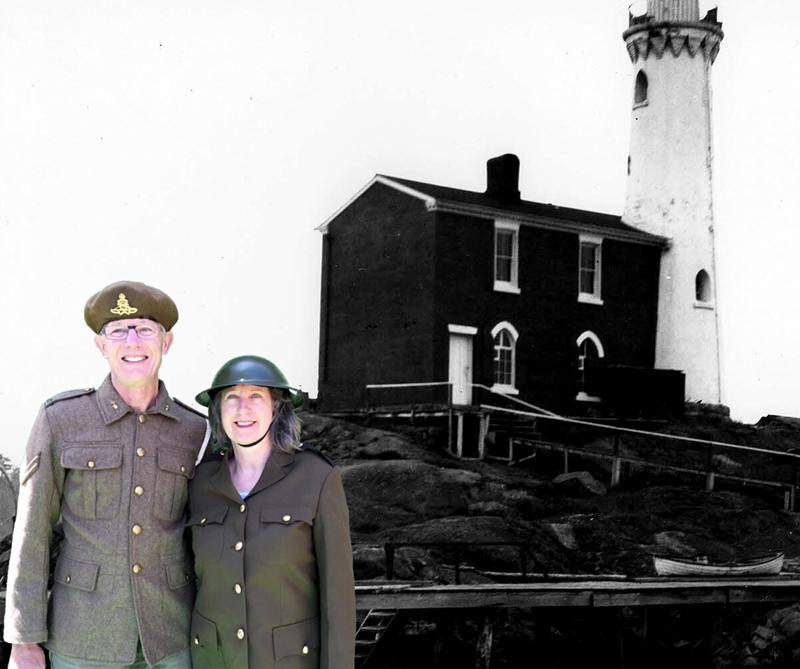 One can tour bunkers, see gun emplacements, and read about the history there. 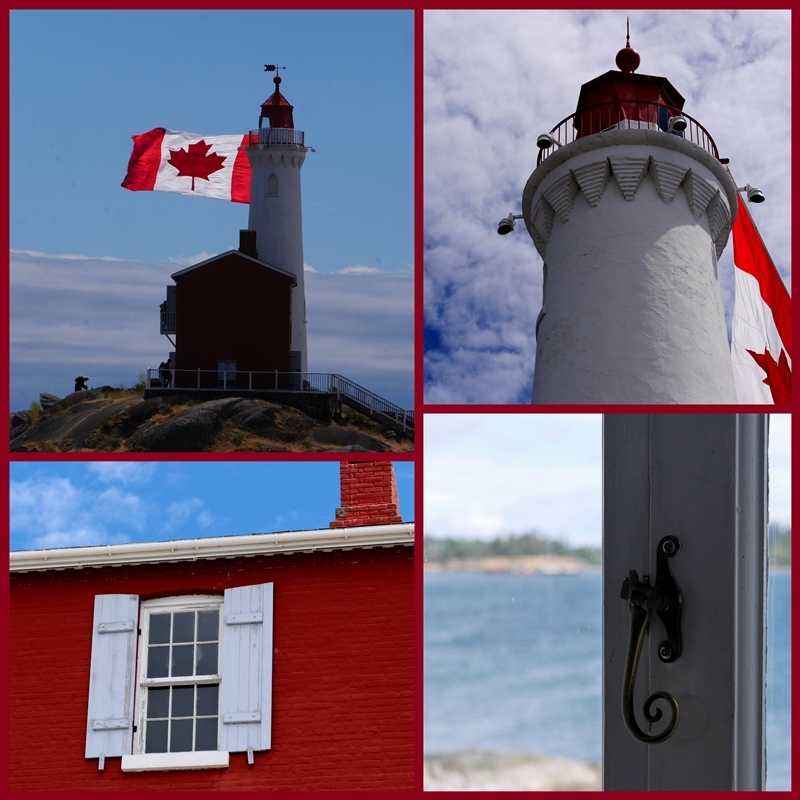 Adjacent to the military site is Fisgard Lighthouse, a fun place to visit and learn. Tim thought he should take a photo of me with my new red backpack, matching the colours of our flag. There was a tremendous wind blowing, and a cruise ship was sitting offshore, probably unable to dock because of the wind. I've visited the lighthouse a number of times and always enjoy the views from the windows, and the windows themselves, especially the hardware. We enjoyed a piece of birthday cake, and had our photo taken against a green screen. Our background choice is a classic lighthouse view. We're dressed as World War II participants, in uniforms that fit us surprisingly well. Tim said the wool jacket itched like crazy. War is a terrible thing and I'm so glad that we haven't seen its horrors, unlike many others who have fought, or who are enduring terrible hardships because of war. In the end, everyone loses. I'm so thankful to be a Canadian. Happy Canada Day! Don't you love to see the wind blow your flag straight out? I do. And you look so crisp and patriotic in your red and white outfit. There's something wonderful about a lighthouse. This was a wonderful way to celebrate Canada Day. You have so much to be proud of and thankful for! Thank you for sharing Fort Rodd Hill and the lighthouse. Aren't they romantic?! And I very much agree, war never has any winners, and I pray for all of the innocent civilians and so many of these war torn countries. That looks like a fun place to visit. We are very lucky to live in a peaceful country. Love the photos Lorrie - you guys had such a good time I know. We've just returned to our hotel in Fredericton, NB after viewing the great fireworks show over the Saint John River. Lovely evening - cool after the heat of the day, no wind, and thousands of people having a fun time. Tomorrow we head for Maine and then New Hampshire. Our next trip to Canada can't come too soon of course!!!!!! Thanks for sharing this, and Happy Canada Day! Perfect way to spend the day. What a great way to celebrate Canada Day, you look so patriotic too in your coordinated outfit. I love lighthouses, so enigmatic and mysterious. Thanks for getting MM off to a wonderful start this week. Happy Canada to you both - I love the way that you dressed in the colours of your flag. You look very chic in your Canada colours - pretty photos. Belated happy Canada Day wishes. Thank you for the beautiful and interesting post! Happy Canada Day! I'm glad you got out to celebrate and there's always thing to learn and ponder over. Love your new red backpack! Enjoy your week! What a lovely way to celebrate our country's 151st birthday! I got a little teary-eyed when they played our national anthem at church yesterday. So proud and grateful to be Canadian! Our "young country" isn't perfect, but we're striving to achieve it! "it has never fired a weapon against an enemy"
Love your outfit...perfect for Canada Day. This is a picturesque lighthouse for sure. Thank Tim for donning that scratchy wool uniform on a summer day. Happy Canada day! I will be celebrating Independence day down here on the 4th. I think it's great that you wore the colors of the flag for Canada day!! These days I am wishing I was Canadian. Smiling! That first picture is just stunning. Love the red of your pants and backpack too. How fun to have your picture taken in the costumes. Loved it all and just know you had a special day. Happy Belated Canada Day. I remember as a child visiting my great-uncle and aunt in Nelson .... I've always been proud to have ties (even if distant) to Canada, but lately I really wish my grandfather had stayed there too!! You too look very good in your WW II costumes! and you in your red backpack very patriotic! looks like a great place to celebrate your Day!! You do look the part, what fun even if a little scratchy! Your great Country is one that I can't wait to visit some time. Happy Canada day. Glad to see you were colour coordinated with the flag! The photo in the old costumes is great. Yes we should remember all those that went before us. Have a fabulous week and thank you for stopping by my blog today. The colours are beautiful - lovely way to celebrate. Belated good wishes. Happy Canada Day! Dearest Lorrie; Happy Canada day♡♡♡ I LOVED to see the picture which your outfit were matching the color with your county's flag. And also the one you two (sweet couple ) were dressed in uniforms. I feel blessed (hope the right word) not having experienced the war like my late father. Happy Belated Canada Day to you and Tim, Lorrie! I loved seeing your pretty pic with your red backpack, and then the one of you and Tim. I am glad Tim insisted on taking a photo of you - you look terrific! Very appropriate red for the day. Belated Happy Canada Day! In another 15 minutes I am off duty from my shift at the historical museum and I will join my hubby and in-laws for our Fourth of July celebrations! Enjoy the rest of your week. Beautiful pictures. I like all the red, especially your back pack. I guess you dress in red and white just as we do, with the addition of blue. A spot of red or more does so much for a photo. A great enhancer! Lorrie - to answer your question on my blog - it was a heron that flew across the video at the end. Happy Canada Day! Coincidentally, you were wearing red and white, the same colour as the flag! I did enjoy your post here, lovely photographs. Many belated happy Canada Day wishes to you. It looks like you had a wonderful Canada Day! I like lighthouses and have visited many over the years--they have a certain charm about them from an eras long ago. The photo of you and your husband in olden days uniforms is so charming. Lorrie, You looked very festive in your red and white outfit, complete with red backpack! How perfect for Canada Day. Enjoyed the photos! Yes, I'm so glad for Canada!